Are you a young leader between 18 and 35 years old, with a proven record of making an impact on your community, country or the world at large? Then we cordially invite you to apply for the Young Bled Strategic Forum 2018 (Young BSF). 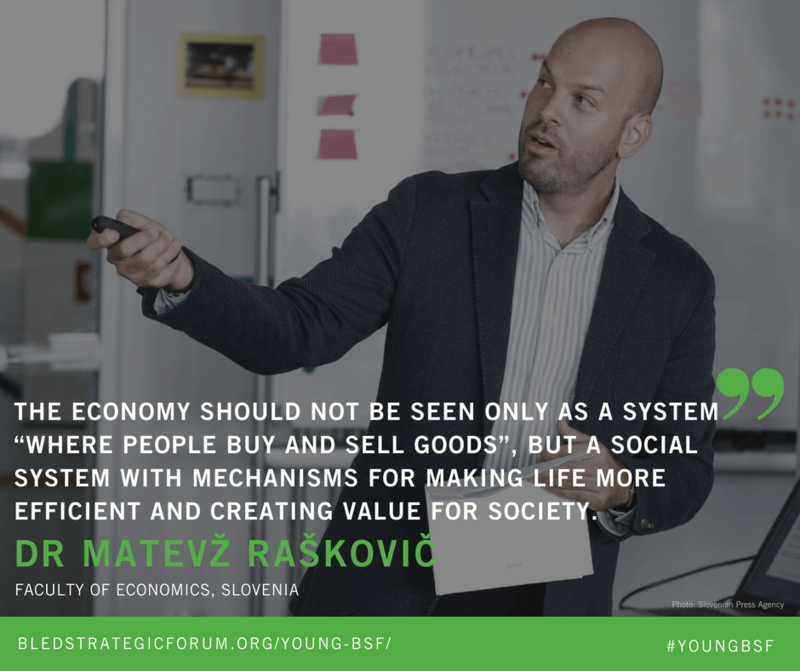 Young BSF is an annual conference bringing together young leaders to engage in lively discussions and develop out-of-the-box solutions to some of the most pressing world issues. The Young BSF model has been growing and changing, and has become a unique meeting place for a diverse array of young leaders, entrepreneurs, bloggers, thinkers and socially active individuals, offering them a platform to share their visions, exchange ideas and connect with one another. Numerous thought-provoking ideas have been suggested over the years, while the main objective remains clear: to bring together audacious and action-oriented individuals from different fields and offer them a collaborative, creative, and inspiring environment for discussions and networking. The 2018 event will take place under the title: ‘Sustainable Security: The Role of Youth in Bridging the Divide’. A sustainable security approach proposes the resolution of the interconnected underlying drivers of insecurity and conflict, with an emphasis on preventive rather than reactive strategies. The central premise of the sustainable security approach is that we cannot control all the consequences of insecurity successfully, but have to work to deal with the root causes of instability. The Forum will place special emphasis on cross-regional cooperation. A new generation of leaders will demonstrate that such cooperation is not only necessary, but inevitable the next positive to be taken in democratization, fighting corruption, terrorism and climate change, and fostering social, economic, and cross-cultural sustainable development. – Security in the Middle East. 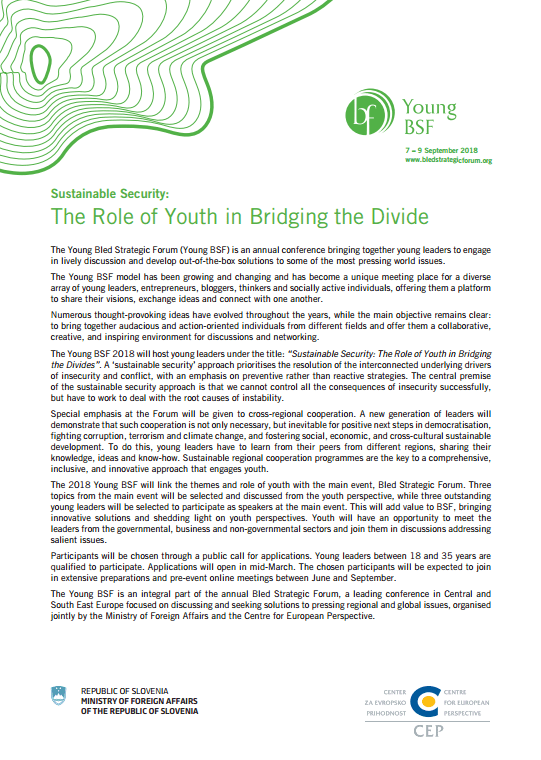 Young BSF is an integral part of the Bled Strategic Forum international conference. To link the two and blur the lines between different generations, three topics from the main event will be selected and discussed from the youth perspective, while three outstanding young leaders will be selected to participate as speakers at the main event. This will add value to BSF, bringing innovative solutions and shedding light on youth perspectives. Youth will have an opportunity to meet leaders from the governmental, business and non-governmental sectors, and join them in discussions addressing salient issues. Young Bled Strategic Forum is committed to ensuring equal opportunities to attend the YBSF are available to young leaders, regardless of their ability to pay. We work closely with our partners to provide all of our participants with accommodation, while a number of travel grants for candidates of various backgrounds and nationalities will be ensured. Travel grants may be awarded to selected participants on an individual basis and only up to the amount decided by the organizers, while we will ensure regional and expertise representation. Countries eligible for the travel grant: Albania, Austria, Belarus, Bosnia and Herzegovina, Bulgaria, Croatia, Czech Republic, Germany, Hungary, Macedonia, Moldova, Montenegro, Romania, Serbia, Slovakia, Ukraine. The selected participants are expected to join in the extensive preparations and pre-event online meetings between June and September. Please note that the official language of the event is English, and that this is a prerequisite for participation in our activities. Apply on www.bit.ly/YBSF2018 by 20th of May 2018 at the latest.